Shorts partner Howard Freeman has recently featured in the Sheffield Star and Sheffield Telegraph, and Brewster Pratap's latest edition of Yorkshire Finance Leaders, due to his honourable responsibilities over the last twelve months in the position of President of ICAEW Sheffield & District. 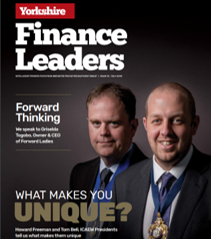 The articles explore the the hard work, time and responsibility associated with being president, gaining an insight into the roles of Howard and fellow President of ICAEW West Yorkshire, Tom Bell. Howard's presidential title emanated from his previous job as treasurer of ICAEW Sheffield & District back in 1998, undertaking this role for five years allowed him to build long lasting relationships with other committee members and former ICAEW Sheffield Presidents. These invaluable friendships will have contributed to Howard's outstanding turnout at his annual dinner at The Cutlers’ Hall in March. Despite treacherous snowy conditions over 300 guests battled the elements to attended the evening highlighting the dedication to the society and it's activities. This impressive attendance led to David Walsh commenting in the Sheffield Star that "Sheffield accountants know how to throw a bash!" Howard was dedicated to raising the profile of Sheffield, wanting visitors to appreciate not only the local industry but also the greenery and parkland of the city. This dedication inspired the Sheffield Star to title their article; "Counting on Howard to raise city's profile." Although Howard is stepping down as president he tells the Yorkshire Finance Leaders that he hopes to stay involved with the ICAEW nationally as well as in the local area.